Universal nano-hybrid composite incorporating a stable phase of glass-ionomer for aesthetic and long-lasting restorations that release and recharge fluoride. 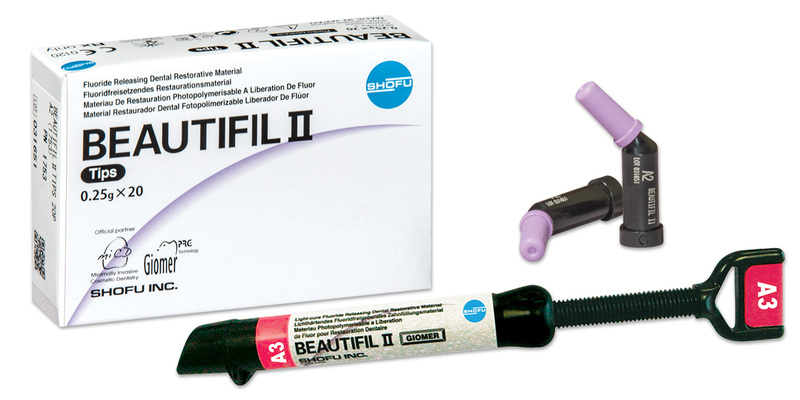 Beautifil II responds to the concentration of fluoride in the mouth while maintaining the strength and stability of a composite resin. In a published clinical study, there were no secondary caries after 8 years1, making it a great choice for pediatric care and high-caries risk patients. In addition, discrete nano fillers (10~20nm) have been included in the filler structure to obtain a filler load of 83.3% by weight for fast and easy polishing with an outstanding surface luster. 1Data on file at Shofu. Contains: 20 x 0.25g capsules. Contains: 1 x 4.5g syringe.